Known as Thai Festival of Lights, Loi Krathong is one of Thailand’s most enchanting and the second best-known festival in Thailand. “Loi” means “float”, and a “krathong” is a special Thai floating sculpture particular to the holiday. The traditional krathong is made from a cross-section of a banana tree trunk, which is then elaborately decorated with folded banana leaves and flowers in intricate towering designs. 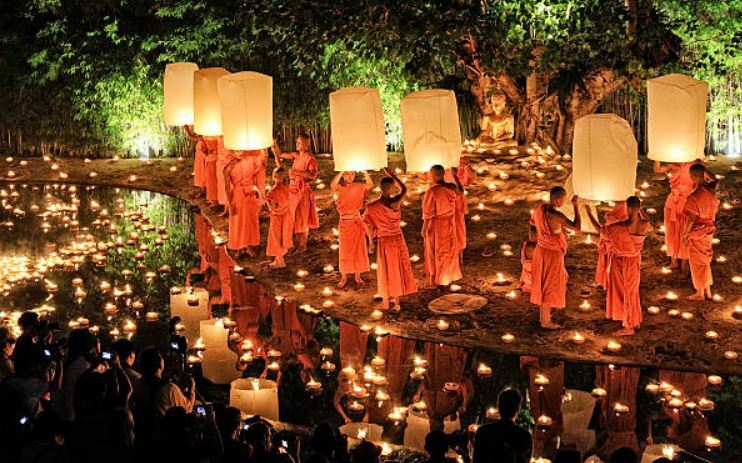 People gather around lakes, rivers and canals to pay respects to the goddess of water by releasing beautiful lotus shaped rafts, decorated with candles, incense and flowers onto the water. So to all our customers and friends, Happy Loi Krathong. As the holiday season approaches and you are looking for that special gift. Lanna Thai Massage has gift certificates available for Christmas giving. We also have authentic Thai Herbal massage balls custom made for us and we import from Northern Thailand. We always offer authentic Thai Massage at our licenced in home studio. ← Haven’t updated for a long time, but have now.